I am quite amused though not surprised by the recent statement of Fr Jegath Gasper Raj, a Catholic priest who had recently collaborated with Kanimozhi, daughter of Chief Minister Karunanidhi in organizing the recently concluded Chennai Sangamam in collaboration with Tamil Maiyam - ostensibly a cultural festival which was held in Chennai city. He has said that some jealous and vested interests are responsible for the recent allegations that he is closely associated with the LTTE. Fr Jegath Gasper Raj has also dismissed as baseless the charge that he has been closely associated with the US based Tamil Socrates Nachimuthu who has been arrested by the FBI in USA for alleged attempt to bribe a State Official to lift the ban on the LTTE. Fr Jegath Gasper Raj has also said that he had never been directly involved with the LTTE and his only claim to closeness to the Tamil Diaspora has been his long and committed work in the areas of human rights and also helping the Lankan Tamil refugees. He has also attempted to clarify that Socrates Nachimuthu was not in any way directly involved with the LTTE and that he had only been active in the FEDERATION OF ASSOCIATION OF TAMIL SANGAMS IN NORTH AMERICA (FeTNA). What has been clearly noted by the main stream English media in India is that Tamil Socrates Nachimuthu, a nuclear scientist, was sharing the same dais with Fr Jegath Gasper Raj at the recently concluded and much touted Chennai Sangamam plus Chennai Maiyam cultural event. No one disputes the fact that Fr Jagath Gasper Raj, a Catholic priest was the driving force behind the just concluded so-called cultural event Chennai Sangamam. A very intriguing and rather disturbing fact which has emerged is that one K Pandiaraj who is the moving spirit behind Tamil Maiyam also happens to be an important member of the 'Think-Tank' of the BJP Party. Fr Jegath Gasper Raj is also another vital element in Pandiaraj's Tamil Maiyam. Many sharp political analysts have not failed to take note of the essentially subversive, mysterious and hidden Sangamams within the wrapper of open SANGAMAMS. I do not know whether Fr Jegath Gasper Raj has anything to do with LTTE. The great American philosopher Thoreau (1817-1862) said it for all time when he declared: 'it takes two to speak the truth; one to speak and another to hear'. However I would like to confront him with the stern, grim and scorching truth about some of the issues he has raised. Any enlightened citizen committed to the cause of national unity, national security and territorial integrity of India has to only carefully go through an explosive book titled 'NGOs, ACTIVISTS AND FOREIGN FUNDS, ANTI-NATION INDUSTRY' edited by Radha Rajan and Krishen Kak, two bold and fearless journalists. The first edition of this book was published in 2006. I had reviewed this book in seven parts in the columns of News Today. The second edition of this book has just come out within six months of the release of the first edition in September 2006. In this second edition, there is a brilliant and scorching article by Arvind Kumar under the title THE OXYMORON CALLED AID in which he has thoroughly exposed the anti-national activities of several Indian organisations (NGOs) functioning in the United States. They all have their overt or covert political agenda despite their calling themselves as 'Charity Groups'. Amongst these groups the biggest, the richest, the most widespread and the most dangerous organisation is the one that calls itself Association for India's Development (AID). This anti-national group has spread its tentacles far and wide and has directly entangled itself with many anti-Indian forces, some of which are connected to Pakistan and also to terrorist groups like the Liberation Tigers of Tamil Eelam (LTTE). AID began its work in 1991 and spread like AIDS among the younger generation in some of the campuses of American Universities. It started recruiting its members from the recurring crop of new students from India landing in USA every year. 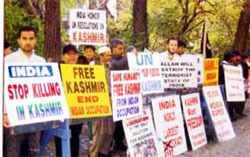 What was concealed mischievously from the Indian students was the fact that AID was involved in many subterranean, subversive political activities in India with close links to or connections with violent Communist and nefarious groups such as the Council on American-Islamic Relations (CAIR), an organization that has been linked to the Jihadi outfit Hezbollah. Arvind Kumar rightly describes AID as Allah for India's Destruction. Having stated that there is a strong umbilical chord between AID and FOSA, Arvind Kumar goes on to say that FOSA was started by a fanatic Muslim Pakistani named Ali Hasan Cemendtaur. The website of this organisation is still owned and controlled by this champion of compassionate Islam. In May 2005, FOSA organized a so called 'Peace March' in San Francisco. It was attended by the same handful of volunteers who work for many of the shady anti-India and anti-Hindu organisations already referred to above and one of the banners at the event read: 'ALLAH WILL DESTROY THE TERRORIST STATE OF INDIA.' It is very clear that FOSA fits in with the classic mould of the organisations created by Pakistan's Inter-Services Intelligence (ISI). AID has maintained close links with Islamic fundamentalists in USA. It has jointly sponsored events with CAIR. It is reliably understood that FOSA had recently roped in a group called the Federation of Tamil Sangams of North America (FeTNA) to plan, organize, launch and act against Indians in the California Textbook Controversy. I remember reading in the Times of India in 2003 that the FeTNA was a Front Organisation for the LTTE. In August 2006, Nachimuthu Socrates, a former director of FeTNA was arrested by the American authorities for supporting LTTE. The CNN reported as follows on this episode: 'Eight men have been charged with plotting to buy surface-to-air missiles for Sri Lanka's Tamil Tiger Rebels, US federal prosecutors have announced. The men also are accused of plotting to bribe US State Department Officials into removing the Tamil Tiger Group from a list of terrorist organisations and of trying to obtain classified information.' This very FeTNA, aligning itself with Chennai Maiyam, played a pivotal role in the recent Chennai Sangamam cultural event! Arvind Kumar has graphically brought out how ill-gotten money is being used by AID and its allies for acts of national subversion and sabotage. I understand that TNSF 'as a policy' would always impose a pre-condition on the libraries in Tamilnadu which they were financially supporting to the effect that the concerned libraries would only support DYFI and no other student body before receiving any funds. AID is a secretive organisation which enjoys the full political support of the UPA Government in New Delhi. It was AID which extended generous financial support to Sandeep Pandey, founder of ASHA and a known Naxalite sympathizer, to undertake a political trip to Pakistan some years ago. Those who work with AID and its allies also seem to be experts in organizing international prizes and awards to themselves as part of a civil and cultural conspiracy. One Sanjit 'Bunker' Roy was given a prize by the Aga Khan foundation for having developed rainwater harvesting structures. Later investigations by The Week clearly revealed that he had hired a professional architect called Neehar Raina to get the job done. Upon this exposure, Aga Khan Foundation changed its citation to fit in with the known facts! A secularly shameless non-communal Roy, ended up by returning his prize. Bunker Roy's wife Aruna Roy, is a Maoist and has worked closely with AID. Like many who have worked closely with AID in its undeclared mission of national subversion, she too has been awarded a prize by the Ramon Magsaysay Foundation. I can only conclude that NGO's like AID, ASHA, CAIR, FeTNA are all committed to their supreme objective of De-Hinduising the Indian State which means rendering the Hindu identity to any aspect of our national life illegitimate and irrelevant in public life and public discourse.